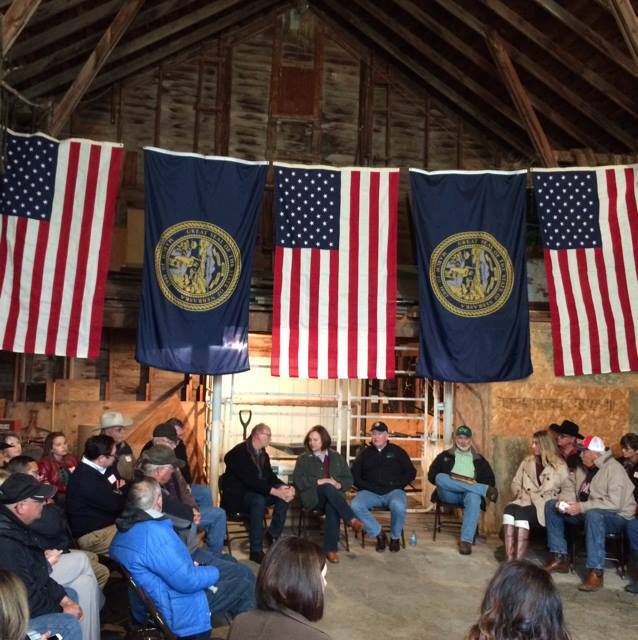 Sonny Perdue, Secretary of Agriculture since April 25, 2017, met with Nebraska producers at Senator Deb Fischer’s ranch in Cherry County Saturday afternoon, despite a late spring storm bringing lots of rain, snow and slushy conditions to the area. Roughly 100 area ranchers and other area residents attended the roundtable, discussing challenges they face in ag production as well as some news that cattle ranchers may be optimistic about. Some of the producers said this was a once-in-a-lifetime opportunity. They were excited to ask Mr. Perdue questions, as well as voice their comments and concerns. Perdue mentioned on his Twitter page that ag producers are “tired of all the government red tape”. The group discussed many topics, including trade with China. Last week it was announced that the United States reached an agreement with China that would allow American beef to be imported into the country for the first time since 2003. Mr. Perdue said this is a great opportunity for American ranchers, and he is convinced the Chinese won’t be able to get enough of it. Perdue stated that this could mean a potential of billions of dollars in exported beef. Country of Origin Labeling, commonly referred to as “COOL” was brought up, and Perdue stated he thought it was probably a settled issue, per a Congressional decision on that matter. The former governor of Georgia also assured the producers that if they make great products, consumers will buy them and they will be happy.